The second Kitty Hawk (CVA-63) was laid down by the New York Ship Building Corp., Camden, N.J., 27 December 1956; and launched 21 May 1960, sponsoredby Mrs, Neil H. McElroy, and commissioned 21 April 1961 at PhiladelphiaNaval Shipyard, Captain William F. Bringle in command. Following shakedown in the Western Atlantic, Kitty Hawk departed Norfolk11 August 1961. After a brief stop at Rio de Janeiro, where she embarkedthe Secretary of the Brazilian Navy for a demonstration of exercise at sea with five Brazilian destroyers, the attack carrier rounded Cape Horn 1 October. She steamed into Valparaiso Bay 13 October and then sailed 2 days laterfor Peru, arriving Callao 20 October where she entertained the President of Peru. At San Diego Admiral George W, Anderson, Chief of Naval Operations, landed on her deck 18 November to witness antisubmarine demonstrations byWiltz and Blueback, a Terrier Missile demonstration by Topeka, and air demonstrationsby Kitty Hawk. Kitty Hawk entered San Francisco Naval Shipyard 23 November 1961, foralterations. Following operations out of San Diego, she sailed from SanFrancisco 13 September 1962. Kitty Hawk joined the 7th Fleet 7 October 1962, relieving Midway as flagship. After participating in the Philippine Republic Aviation Week Air Show, Kitty Hawk steamed out of Manila Harbor 30 November 1962, and welcomed AdmiralH. D. Felt, Commander in Chief, Pacific Fleet, for a demonstration of modernnaval weapons 3 December. The ship visited Hong Bong early in December andreturned to Japan, arriving at Yokosuka 2 January 1963. During the following 2 months she visited Bobe, Beppu, and Iwakuni before returning to San Diego2 April 1963. On 6 June 1963, President Kennedy, with top civilian and military leaders, boarded Kitty Hawk to witness a carrier task force weapons demonstration off the California coast. Addressing the men of the task group from KittyHawk President Kennedy told them that as in the past, control of the seasstill means security, peace and ultimate victory. He later wrote to Presidentand Madam Chiang Kai-Shek who had witnessed a similar demonstration on boardConstellation: "I hope you were impressed as I was, on my visit toKitty Hawk, with the great force for peace or war, which these mighty carriersand their accompanying escorts provide, helping to preserve the freedomof distant nations in all parts of the world." Following a series of strike exercises and tactics reaching along theCalifornia coast and off Hawaii, Kitty Hawk again sailed for the Far East. While approaching Japan she learned an assassin had shot President Kennedy. Flags were at half mast as she entered Sasebo Harbor 25 November'1963, theday of the President's funeral and as senior ship present, she had the sad honor of firing memorial salutes. After cruising the South China Sea andranging to the Philippines in readiness operations with the 7th Fleet, shereturned to San Diego 20 July 1964. Kitty Hawk overhauled in Puget Sound Naval Shipyard, then trained alongthe western seaboard. She sailed from San Diego 19 October 1965, for Hawaiithence to Subic Bay, P.I., where she prepared for combat operations offthe coast of Vietnam. Kitty Hawk was awarded the Navy Unit Commendation for exceptionally meritorious service from 26 November 1965 to 14 May 1966 while participating in combatoperations against the insurgent Communist guerrilla forces in the Republicof Vietnam. The valiant men of her Carrier Air Wing 11 flew over 10,000sorties and delivered over 10,700 tons of ordnance against enemy forces. The officers and men of Kitty Hawk displayed undaunted spirit, courage, professionalism and dedication to maintain their ship as a fighting unitunder the most ardent operating conditions to enable her pilots to destroy vital military targets in North Vietnam despite intense opposition and extremelyadverse weather conditions. Kitty Hawk returned to San Diego in June 1965 for overhaul and traininguntil 4 November 1966 when she again deployed to serve the cause of freedomand national security in waters of Southeast Asia. Kitty Hawk arrived at Yokosuka, Japan, 19 November to relieve Constellation (CVA 64) as flagshipfor Rear Admiral David C. Richardson, Commander Task Force 77. On 26 NovemberKitty Hawk departed Yokosuka for Yankee Station via Subic Bay, and on 5 December aircraft from Kitty Hawk began their around-the-clock missions over North Vietnam. About this time Kitty Hawk-already accustomed to celebritiesas guests-entertained a number of extremely prominent visitors: William Randolph Hearst, Jr. ; Bob Considine; Dr. Billy Graham; and John Steinbeck, among others. She remained in the Far East supporting the fight for freedomin Southeast Asia until departing Subic Bay 28 May 1967. Steaming via Japan, the carrier reached San Diego 19 June and a week later entered the naval shipyard at Long Beach for maintenance. Kitty Hawk returned to San Diego25 August and began a rigorous training program to prepare her for future action. KITTY HAWK underwent three overhauls in the Bremerton, Wash., Naval Shipyard in 1977, 1982 and 1998. The ships most significant maintenance period, however, was a Service Life Extension Program (SLEP) in the Philadelphia Naval Shipyard beginning in 1987. That rigorous four-year overhaul added an estimated 20 years to the planned 30-year life of the ship. KITTY HAWK displayed the long reach of carrier aviation by completing a world cruise on the way to Philadelphia and returned by rounding the southernmost tip of South America. The Hawk set sail on its 17th deployment on June 24, 1994. During the six-month cruise, KITTY HAWK, and Carrier Air Wing Fifteen, under the direction of the Commander, Cruiser Destroyer Group FIVE, provided a stabilizing influence in the Western Pacific during a time of great tension in the Far East. the best carrier in the Pacific Fleet. Persian Gulf aboard the USS ABRAHAM LINCOLN (CVN 72). workups, enjoying a very successful participation in Exercise Rim of the Pacific 96, a multi-national exercise taking place around the Hawaiian Islands involving the maritime forces of Canada, Japan, South Korea, Chile and Australia, in preparation for deployment in October 1996. KITTY HAWK began its 18th deployment Oct. 11, 1997. En route to the Arabian Gulf, the KITTY HAWK/CVW-11 team made port calls in Hong Kong and Singapore. Christmas was celebrated inport Bahrain, and two Gulf port calls were made to Jebel Ali, U.A. E. Returning from a successful tour at the "tip of the spear," the crew enjoyed liberty in Fremantle, Australia and Hobart, Tasmania. After a brief stop in Hawaii, KITTY HAWK returned to San Diego April 11, 1997. Throughout her illustrious career, KITTY HAWK has demonstrated the range, sustainability, flexibility and capability that are the hallmark of carrier aviation. In October 2001, Kitty Hawk again made history and helped redefine roles. Following the Sept. 11 terrorist attacks at the Pentagon and World Trade Center, Kitty Hawk deployed to the North Arabian Sea in support of Operation Enduring Freedom. The ship served as an afloat forward staging base for U. S. special forces, showing the continued adaptability of U. S. aircraft carriers. 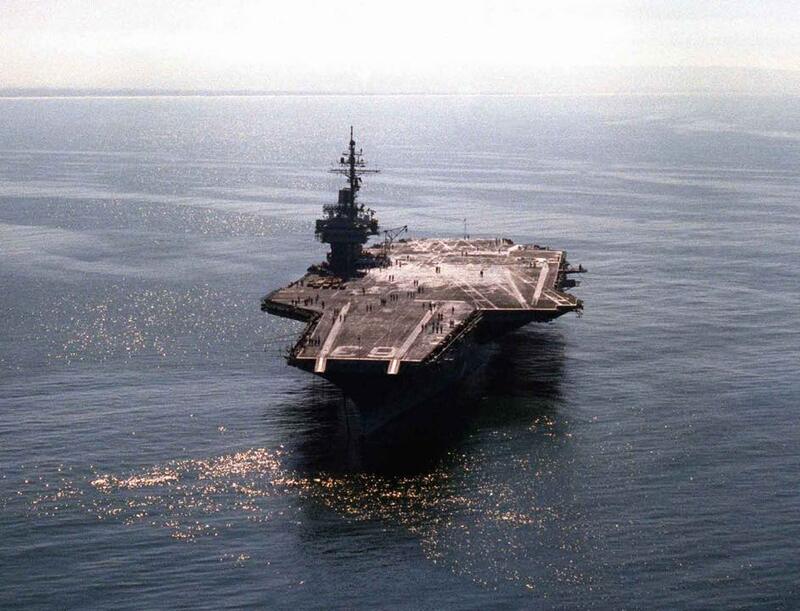 In April 2002, Kitty Hawk was underway for her scheduled spring training. Along with a Guam port call, the spring underway included port visits to Singapore and Hong Kong, where the crew celebrated Kitty Hawk's 41st birthday. In the fall of 2002, Kitty Hawk was training in the Western Pacific. Kitty Hawk and her battle group combined with U. S. Air Force units and elements of the Japan Maritime Self Defense Force to conduct AnnualEx 14G in the waters surrounding Japan. Later, Kitty Hawk's crew made a port visit to Hong Kong, where they celebrated Thanksgiving. In January 2003, while undergoing routine training in waters near Japan, Kitty Hawk took on a new nickname - the "Battle Cat" -- reflecting her continued strong presence in naval operations. Orders were received in February 2003 to transit to the U. S. Central Command area of responsibility to support the Global War on Terrorism and to prepare for future contingencies. Kitty Hawk was soon involved in Operations Southern Watch and Iraqi Freedom in the North Arabian Gulf, serving 104 continuous days at sea. Kitty Hawk returned to Yokosuka May 6, 2003, immediately entering an extensive dry-dock period, or dry-docking ship's restricted availability (DSRA).